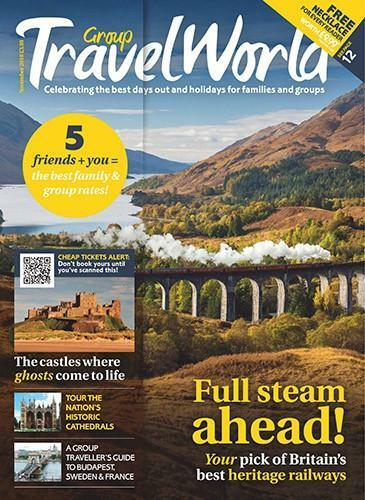 Group Travel World is the UK and Europe’s best-selling group travel magazine. A subscription is the essential read for all Group Travel Organisers, school trip organisers, work and social travel clubs and tour and coach operators, as it features special familiarisation trips, exclusive group rates and organiser incentives that won’t be found anywhere else. It is the best source of inspiration for anyone who needs to plan and organise days out or group breaks, with attractive ideas and helpful detailed contact information. The magazine is full of the latest tourism and travel industry news, celebrity interviews, feature articles, reviews and insider information. Subscribing gives readers access to the website, which in addition to extended versions of everything in the magazine, has a comprehensive directory of attractions, hotels, tourist boards, restaurants and coach operators offering exclusive group rates and incentives. I recently bought a copy of Group Travel World as I run a small ladies group and found lots of ideas for excursions that we hadn&apos;t previously thought of! Well done! !